Dave Friedman’s Smallbox, 50 Watt Head was designed for guitarists that want the classic tones reminiscent of great vintage plexis as well as Friedman’s more modern high gain offerings. The Smallbox features two channels, the first giving you those classic plexi tones that clean up nicely with just a twist of the guitar’s volume knob. It goes from clean to crunch to that full-blown plexi roar. 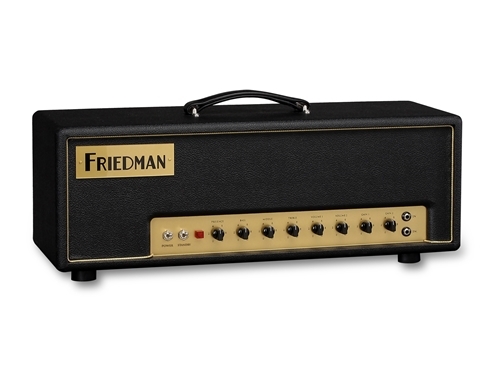 The second channel features the modern high gain tone on which Friedman has built his reputation. The Smalbox was designed to take pedals and loves boosts, OD’s, phasers, flangers, tremolos and wahs, while the brand new ultra-transparent series effects loop handles your time-based effects pedals and rack units. The handcrafted in the USA head features beautiful Tolex encasing tongue and groove Baltic Birch construction and built to withstand the rigors of the road.